"(S)he was not fond of mystery stories. Nobody in them ever seems to feel sorry about murders, she had said. They're presented as a problem, m'dear, her father said. What's more, they generally show the murdered person as someone you can't waste any pity on. I'm sorry for them, she said. I hate it when they're found with daggers sticking in them and their eyes all staring from poison and things like that." 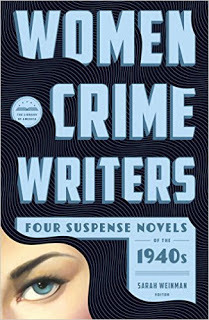 That's from Elisabeth Sanxay Holding's novel The Blank Wall, included in the new collection Women Crime Writers: Eight Suspense Novels in the 1940s and '50s, edited by Sarah Weinman for the Library of America. That paragraph will catch the eye of readers today, I suspect, and it makes a good starting point for discussion of the entire collection. What makes these eight writers different from their predecessors? From their successors? From their male contemporaries? What traits do the eight share with all those groups? It might also make for interesting comparison with Raymond Chandler's famous assessment of Dashiell Hammett's contribution to crime writing in "The Simple Art of Murder." "`When, during the 1936 campaign, I learned that the President was a devotee of mystery stories, I voted a straight Republican ticket.'" Sarah Weinman will discuss Elisabeth Sanxay Holding on a panel I'll moderate at Bouchercon 2015 in Raleigh, N.C., in (yikes) two weeks. The panel is called "Beyond Hammett, Chandler, Spillane, and Macdonald," and it happens Thursday, Oct. 8, at 2:30 p.m.
My Bouchercon 2015 panels: YA? Why not?